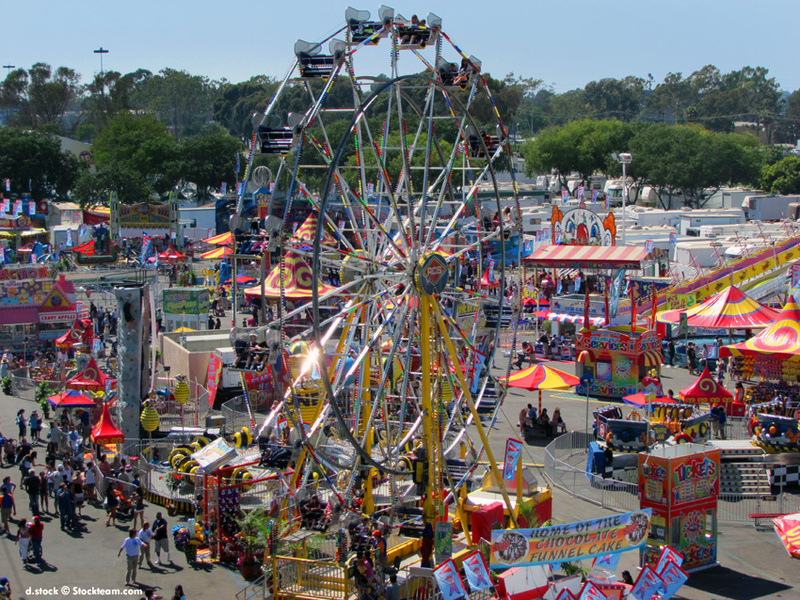 The Orange County Fair is held every year in July, bringing the old-fashioned home arts, animal and food contests to Costa Mesa, California where the Orange Orange County Fairgrounds are located between Harbor Boulevard and Fairview Drive. Each year a theme celebrates some sort of fruit of food. Tomatoes, Strawberries and Lemons have all had their day in the sun. The fairgrounds are decorated with posters, contests and color schemes reflecting the theme. The fairgrounds are utilized all year long for exhibitions, competitions and a variety of events and entertainment but when the Fair comes to town, it takes over the entire facility. Old fashioned animal competitions with children and adults competing for prizes for best cattle, sheep and pigs, best pies and cakes, quilts and crafts award prizes and are on display during the fair. The largest attractions are the daily entertainment and vendors with carnival rides, game booths and food. People go annually to eat ribs, fire-roasted corn, cream puffs and all sorts of meals and desserts. Attendance at the fair is incredible with nearly one million people visiting the Orange County Fair each year. Special days and nights provide discount admissions for seniors, children and adults and families. Daily concerts, dancing and sports exhibitions occur during the day and nights bring name entertainment.